Part of my weekend activity is to visit interesting places in Singapore, and the beautiful old architecture littered around China town and older parts of Singapore has always caught my attention. Some old shop houses are converted into boutique hotels – one of them is G-hotel. 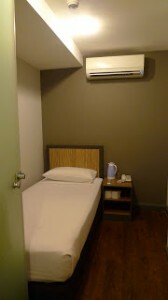 A contemporary looking boutique hotel located on one of the streets in the Chinatown area. It’s reception area is clean and cozy. 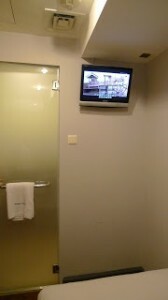 The receptionist was friendly and kind enough to let me view one of the guest rooms, which is the standard room. I was surprised at how small the guest rooms are though. But it appeared to be new, with wooden floor, and has almost everything that a guest would need. The hotel has put in some space-saving tips, such as hanging the TV the wall and installing towel rails on the frosted glass door leading to the shower and toilet. 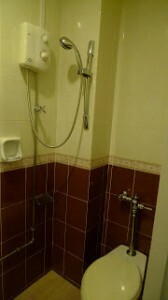 As you can see, the WC is right next to the shower … and the color don’t exactly match the decor of the room.